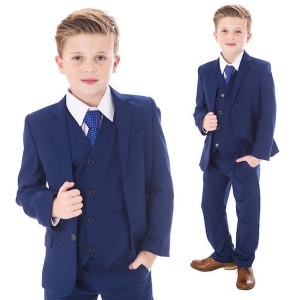 Royal Blue 5 piece slim fit jacket suit for baby boys, toddler or older boy. 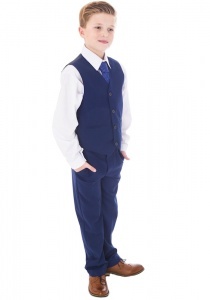 The perfect outfit for any special occasion including a christening, wedding as a pageboy / guest or formal occasion. 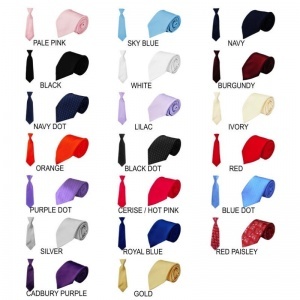 Tie: Satin effect blue & white polka dot pattern tie, complimenting the suit perfectly. This royal blue 5 piece slim fit outfit will make him look like the perfect handsome gentleman at a christening, wedding as a pageboy / guest or a special occasion. 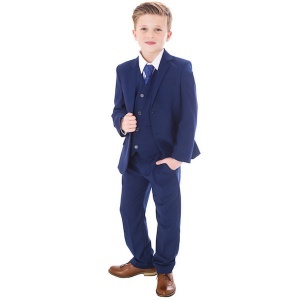 Ordered 3 of these blue suits and the brown brogues for my son and 2 nephews, lovely feel and fit when they all tried them on last weekend and the colour is spot on. Price was cheaper than hiring so it was a nice affordable transaction. Fully deserves a 5 star rating for product and service. Fantastic quality, true sizings and they look amazing. The boys look fab in these. Great quality and a nice fit. Customer service spot on! Bought 2 of these suits for my boys and they match up well with my suit. Was panicking a little as wedding in 4 weeks and thought I was running out of time but ordered on Sunday evening and they were at my doorstep on Tuesday. A great service to receive wedding suits in less than 2 days. 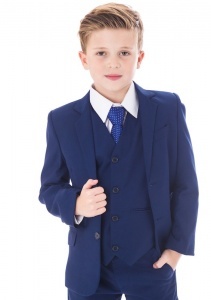 Will highly recommend you for boys wedding suits. I ordered 4 of these suits for our wedding and they don’t disappoint! The boys look lovely in them. Thank you!